Join Pro Dive Cairns to complete your PADI Divemaster course and visit up to four easterly Outer Great Barrier Reef locations, taking in sites selected for their extravagance of marine life, and excellent visibility. "Divemaster" is the first level of the PADI "Professional" ratings. On successful completion of this program you will be qualified to supervise recreational diving activities either boat or land based. It also allows you to act as an Instructional Assistant and is the minimum rating for employment in the diving industry. The 17 day course is divided up into specific Divemaster training, assisting an Instructor teaching Open Water, Advanced and Rescue courses (when available) and 2 x 3 day/2night live-aboard dive trips to the outer Great Barrier Reef. During these trips you will get up to 20 dives consisting of a combination of training and recreational dives. The pre-requisites for this course are PADI Rescue Diver certification or equivalent and minimum age of 18 yrs, with a minimum of 40 logged dives. In order to complete your certification you will need to have 60 logged dives. Days 1-2:These two days are spent assisting a PADI Instructor conducting the theory and pool sessions of a PADI Open Water Diver Course. These sessions will serve as a reintroduction to the theory and skills of the Open Water Course for those candidates who have been away from a dive teaching environment for a long time. Day 3:Study & preparation for the remainder of the course. Day 6: 8:00-14:00 Evaluated Pool Session. 14:00-17:30 Exams will be conducted for: Divemaster Conducted Programs Supervising Certified Divers. After examinations are complete time will be given to review exams and for further exam revision. Also your Instructor will conduct review and evaluation of your Pool session. Day 8: 8:00-14:00 Evaluated Pool Session. 14:00-17:30 Exams will be conducted for: Supervising Student Divers in Training Equipment. After examinations are complete time will be given to review exams and for further exam revision. Also your instructor will conduct a review and evaluation of your Pool session. Days 9-11: These days will be spent on the Outer Reef doing a 3 day, 2 night live aboard dive trip. In this section of the course, you will complete 5 evaluated training dives, assisting an Instructor with both open water and Advanced courses on the boat. During your 3 day 2 night trip you will also be evaluated on Diver Rescue skills and on other non teaching Divemaster duties. Also you will have a dive site designated for your mapping exercise. Day 12: Time off to study for exams. Day 13: Assisting with Day 1 of the PADI Rescue Course. Day 15: 8:30-14:00 Evaluated Pool Session. 14:00-17:30 Exams will be conducted for Diving Physics and Physiology. After examinations are complete time will be given to review exams, retests. Additional time after exam revision & retests should be used for completion of your Dive site mapping exercise. Days 16-18: Boat Training. 3 day 2 night reef trip during which you will be evaluated on both teaching and non-teaching Divemaster duties to complete your course requirements. On successful completion of this course, you will be required to submit to PADI, together with your Divemaster paper work, PADI membership fees, PADI insurance if required, a Divemaster medical certificate, and 2 passport size photographs. You must be sure you are capable of completing all the swimming test requirements on days 1 and 4 of the course. You must also prepare to complete all the exams on the specified days. The course structure is a guide and can be changed within reason although any additional days required by you for re-sitting exams, etc, may incur an additional charge. PADI Rescue Diver Certification or equivalent with a minimum of 40 logged dives. In order to complete the certification, 60 logged dives will be needed. 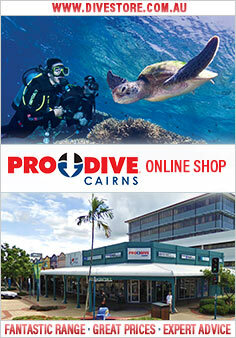 Pro Dive can help arrange extra dives if needed. Minimum age is 18 years, with no maximum age. An AS2299 Dive Medical is required. Some medical conditions may preclude you from diving. Asthma, diabetes, epilepsy and pregnancy are the most common ones encountered.